Jeremiah 32:20. Which hast set signs and wonders in the land of Egypt, even unto this day, and in Israel, and among other men; and hast made thee a name, as at this day; It is interesting that the prophet Jeremiah in the Bible verse above refers to the Great Pyramid as a wonder and we know it as one of the Seven Wonders of the World, the wonder in Israel refers to Solomon’s Temple and the wonders among other men must refer to the Stonehenge group of monuments, there are no other contenders. The Stonehenge group of monuments were already ancient in Jeremiah’s time, Stonehenge, Silbury Hill, Avebury, Solomon’s Temple and the Great Pyramid are referred to in the same verse of the Bible, and we have demonstrated how the designs of the English monuments profoundly interact with each other and the Great Pyramid therefore we would expect the design of Solomon’s Temple to also interact with the other monuments on the list and it does if the cubit referred to in the Bible is the great cubit of 1.76 Imperial feet. The mean circumference of the lintels on top of Stonehenge’s Sarsen Circle is 316.8 feet and the mean length of each lintel is the Biblical reed of six great cubits = 10.56’. 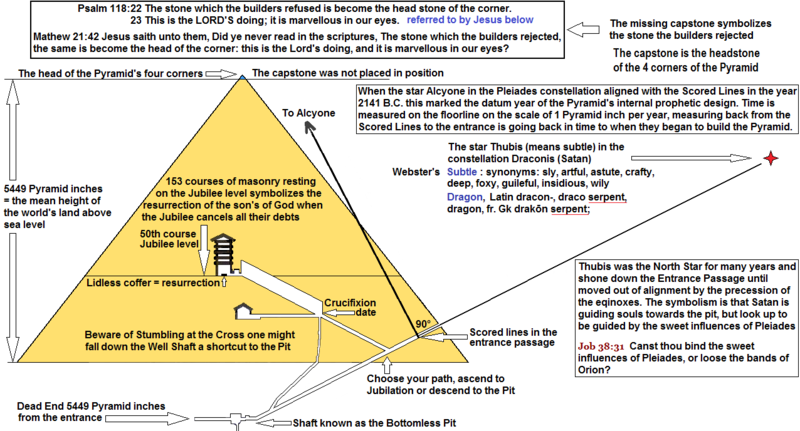 The two Bible verses below refer to the Great Pyramid and have a gematria of 5449 in the original Hebrew text which refers to the 5449 Pyramid inch height of the Pyramid from the socket level to the summit platform, and the 5449 Pyramid inches on the floor line from the entrance to the Dead End, the 5449 Pyramid inches also refers to the mean height of all the world’s land above sea level. The Lord was born as an Israelite so that he could legally redeem his kindred people according to the law as a kinsman redeemer by paying the debt or the penalty they had incurred by their disobedience and breaking the vows they made at Mount Sinai. He also came as a descendant of the House of David which secured his right to the crown but he was rejected of men and like the Pyramid he was not crowned, but it’s not over yet and one day the whole world will know he is the King of kings. The Israelites were given the Ten Commandments at Mount Sinai and made a vow to obey which they broke this is why they needed to be saved from the penalty demanded by the law, Jesus purchased their freedom by paying the penalty himself this also paid everyone’s penalty. The Bible says Israel was his treasure buried in the field and he purchased the whole field to gain the treasure, and the Bible says the field represents the world. The lidless coffer symbolizes the resurrection and the coffer is resting on the 50th course of masonry which represents the Jubilee year, at the end of 7 sabbatical years (49 years) the Jobel (trumpet) was blown to announce the start of the Jubilee year. This was when all debts were cancelled, slaves were set free and people regained their land inheritance if they had sold it, the buyers of the land knew they only owned it until the Jubilee year. People could sell themselves into slavery and the courts could sell a law breaker into slavery if he had to pay compensation and did not have the means to do so. Slaves could buy their freedom at anytime if they had the money but if anyone else wanted to redeem them their master could refuse to release them unless the redeemer was a kinsman, hence the term kinsman redeemer. When Jesus saved his people he saved the whole world, (he saved us from the second death) which is referred to by Paul in Romans 6:23 For the wages of sin is death; but the gift of God is eternal life through Jesus Christ our Lord. So eternal life is a gift through the Lord Jesus Christ and if you accept the gift it means you claim exemption from the second death (wages of sin = death penalty) because Jesus paid it for you anyone can refuse the free gift of salvation and pay the penalty personally, the law demands payment and it will be paid one way or another. People who had no means of knowing the law are also judged with justice according to their deeds, this probably does not include the deliberately ignorant i.e. the ones who could have known and should have known but hid from the truth. The lidless coffer and 153 courses of masonry are resting on the Jubilee level and the expression “Sons of God” (Beni Ha-Elohim) has a gematria of 153 it occurs seven times in the Bible’s Hebrew text. The symbolism is that the Sons of God (153) standing on the 50th course of masonry are celebrating (Jubilation) the Great Jubilee all debts have been cancelled they have been redeemed from sin (death) they have regained their inheritance and are resurrected which is symbolised by the lidless coffer. The sign of the fish was a symbol used by followers of Jesus and there were 153 fishes caught in the net and not one was lost, this is also in harmony with the above, 8 x 153 = 1224 which is the gematria of the Greek word for fishes, and 1224 is also the gematria for the Greek words “the net”, in the Biblical meaning of numbers 8 symbolizes a new beginning and relates to Jesus = 888 gematria. There are 7 days in a week and day 8 begins a new week. There are 7 notes per row on the Musical Scale Chart and the 8th note starts the next row, the chart’s 7 rows of 7 notes remind me of the 7 sabbatical years from the end of the Jubilee to the beginning of the next heralded by the blowing of the Jobel (trumpet), also the 7 golden candlesticks in Solomon’s Temple held 7 candles each. Obviously no one was buried in the Great Pyramid which symbolizes resurrection and there is no evidence of a burial, Herodotus said Khufu was buried in an obscure place, orthodox experts disagree and dismiss this, the fact that there is no evidence of anyone being buried in the Great Pyramid has no effect on their theories, who needs evidence when we have the opinions of experts? Jesus was born on the 29th of September 2 B.C. if our calendar had been formulated correctly Jesus would have been born in the year zero but our calendar skips the year zero going from 1 B.C. to 1 A.D. so the closest we can get to the correct date with our calendar is to pick the year before or the year after Jesus was born. Jesus was born very appropriately on the Feast of Trumpets according to the Pyramid’s prophetic time scale and this is also borne out by careful analysis of relevant information found in the Bible along with all the relevant existent secular historical documents. Some estimations of the date of Jesus’ birth are in error because not all the information available was taken into consideration, but if you think the Pyramid’s Architect knew the real date you don’t need opposing assumptions and opinions. 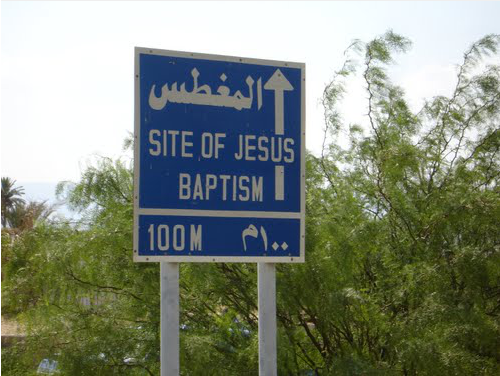 Below is one of many pictures found on Google Earth associated with the place where Jesus was baptised in the River Jordan, measuring 316.8 Roman miles from the Pyramid takes us to that position on the Jordan, whether this is exactly where Jesus was baptised or upstream or downstream I do not know and the Google Earth rule tool is not accurate enough to resolve this. Have the locals selected the exact place where Jesus was baptised, there has always been a ford there which is where the Ark of the Covenant crossed and if there are steep banks either side this would restrict the area suitable for John the Baptist to do baptisms.